Heart and Soul has definitely won me over! What a great color. So glad you found an affordable version. Heart Soul! Wow. Such beautiful shoes. Sweet price, too. What a beautiful shoe. Great find! True life blue suede shoes! I think the Heart Soul shoes are perfect! Hahaha I'll take the $69 pair, please! ;) Love this color. Another amazing find, darling ~ these look nearly identical! They are almost identical! 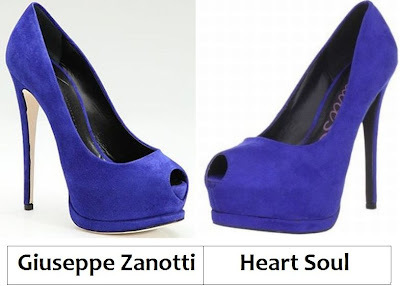 I love the heel of the Heart Soul one better though. Such a beautiful find! Tightwad for me! I absolutely love the color! As much as I love Zanotti, I'm feeling thrifty. I'll take the HS...still gorgeous for a lot less! How stunning! I know need more blue heels! I heart the Heart Soul ones. either way i am in love with the color. How fun would these be with pink jeans or even yellow one!! What a great color. For that price Heart & Soul for sure!! This color is absolutely BRILLIANT. I'm in love. Ehh I'm really not a fan of huge, chunky platforms, so the Heart Soul is off my list. The Zanotti is much sleeker. oh gosh, i want the expensive ones! though realistically, I would go for the cheaper ones. I love that color! I want shoes in this color. It's my new mission in life. Basically idential. I'll go with Heart Soul since they are $70! Ok, I think I need more of this color in my life. So gorgeous! Ooooooo i love a good deal... but i have to say comfort is the key... if they 70 dollar ones are comfy, then to hell with the zanotti's lol. Oh what a beautiful color!! Love the Zanotti's love them all.